Every successful event has queues at opening time on day one. If you want, you can have staff equipped with hand-held scanners and smartphones or iPads out among the queues. They can use these to scan Fast Track barcodes. The attendees they're helping can then pick up their badges from a designated desk. Some organisers give our Queue busting technology to the VIP meet and greet people. Others use it just to increase the number of attendees being processed. It's fast, easy and efficient – just what you need at registration on day one. The products below can also be used as queue busting options. 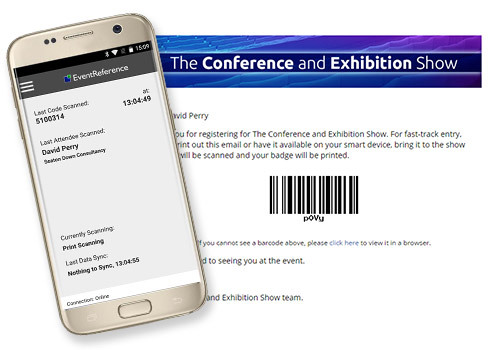 Using the scan and print feature on the WebScanning app, simply scan the e-badge barcode and the attendee's badge will print out at the designated printer. Fast, easy, efficient. This allows you to move around the registration area and interact with your attendees. Greet then at the entrance, scan their barcode, and direct them to the printers. Using an IOS or Android tablet can give you flexibility to print badges on the go. Simply login into your event reference account, search for your attendee, open their record and press print badge. This will then print to the dedicated printer you have allocated. IOS tablet users can also take advantage of advanced report views, please talk to your account/project manager for more information. Mobile badge printing can also be used whilst outside the venue, take a look here. For the above options to work a reliable internet/Wi-Fi/3g connection is required at all times.